Download the ISEP Fact Sheet. The focus of ISEP is the critical middle school experiences of students in science and engineering as they transition to high school. 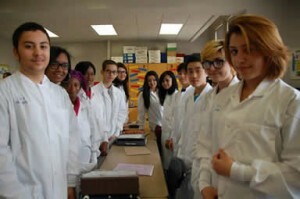 The project utilizes an innovative approach to teacher professional development among 12 high-needs urban schools (including “feeder” middle schools and their corresponding high schools) via courses and interdisciplinary research experiences, development of science and technology classroom materials that are aligned with state science learning standards, and inquiry-based curricula. The ISEP also combines novel mentoring approaches and expanded professional learning communities to build leadership and resources for improving science education in high-needs/high-potential urban schools. The learning communities cultivate mentoring relationships involving middle and high school teachers and students, University at Buffalo and Buffalo State College STEM faculty, education faculty, undergraduate students and graduate students, volunteer STEM professionals, and/or parents. A key program component is the development of a successful mechanism to integrate the latest scientific and engineering research approaches into the experience base of middle and high school teachers. “Research Experiences for Teachers” are widespread across the ISEP with teachers involved in interdisciplinary team-based research programs that focus not only on the research experience, but also on the development of classroom materials that are aligned with learning standards and draw from multidisciplinary approaches. Approximately 48 Buffalo Public Schools teachers each year have the opportunity to access cutting edge research through multiple science and engineering tracks. The ISEP team, which includes principals, links these research experiences to intensive leadership development training, in which teachers align challenging science courses and curricula with national and New York State Learning Standards, focusing on increasing the number of inquiry experiences for students. Ultimately, the teachers enhance their mentoring skills, learn to form expanded learning communities of science educators within their schools, and impact their entire school culture. ISEP is conducting educational research on the processes and conditions in which science teachers develop interdisciplinary science inquiry knowledge, and how this knowledge may be translated into interdisciplinary pedagogical content knowledge (PCK) that ultimately improves student science learning. Thus, the research questions for the ISEP are: (1) What are science teachers’ conceptions of interdisciplinary science inquiry? How do their conceptions change through intensive summer research and ongoing professional developments? (2) How do science teachers translate interdisciplinary science inquiry experiences and understanding gained in university research laboratories into their classroom inquiry instructional practices, i.e., how do science teachers develop interdisciplinary science inquiry PCK? and (3) How do professional learning communities support teacher development of interdisciplinary science inquiry PCK? Findings produced through ISEP are being disseminated throughout the district via a well-organized science teachers network, regionally and statewide using NYLearns.org, through a project website, and through presentations and publications via regional and national venues. Serves students and tracks their progress during the pivotal transition from middle to high school (a time when many young people lose interest in science). Emphasizes engineering design activities, as well as interdisciplinary science inquiry. Develops Professional Learning Communities and opportunities to share ideas face-to-face, or through social media. Involves undergraduate and graduate students from UB, Buffalo State College and other area colleges, as well as volunteer faculty and science/engineering/technology professionals from the academic and corporate communities. Serves Buffalo’s rapidly growing immigrant population, in which more than 80 languages are spoken, including students from Burma, Somalia and many other nations. Uses new labs and facilities through Buffalo’s comprehensive school reconstruction project—the first of its kind in New York State.